Renovated by Henry Turley Company in 2011, Van Vleet Flats is a mixed use building with 60 stunning loft apartments and 15,000 square feet of commercial space — right on Main Street. So you’ll find everything downtown Memphis has to offer right at your doorstep — from five-star restaurants to world famous fried chicken. Stroll over to FedEx Forum to catch some hoops. Point your out-of-town guests in the direction of Beale Street. And discover more than 20 bars and restaurants within a two-block radius of the Flats. Back in 1871, when people came to town by way of the Mississippi, a young man named Peter P. Van Vleet hopped off a riverboat en route from Michigan to Charleston and decided to make Memphis his home. And he prospered. In 1884, he founded a wholesale drug company, Van Vleet & Co. Ten years later, operating from offices on Main Street and a warehouse on Monroe, his company merged with three other local firms to become Van Vleet-Mansfield Drug Co. In 1917, two years after Van Vleet’s death, the company consolidated its offices and warehouse space into its new building at Second and Gayoso— a monument to the company’s success. 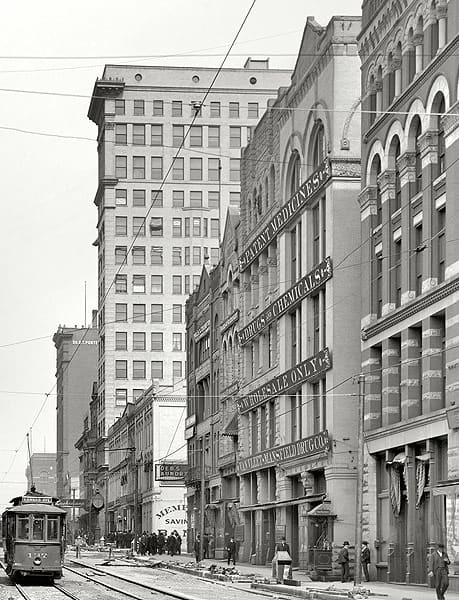 By then, Van Vleet-Mansfield Drug Co. was one of the largest and most progressive drug companies in the United States — and Memphis was a leader in the wholesale drug market. With the sweeping scale of a former warehouse, historic architecture and period details, Van Vleet Flats is a one-of-a-kind conversion.